SMYRNA, Del. -- Four people were arrested amid an investigation to marijuana sales at a bar in Smyrna, Delaware. The state's Division of Alcohol and Tobacco Enforcement said the arrests were made on Thursday after an investigation into The Celtic Pub at 699 Jimmy Drive. Several undercover purchases were made from two suspects, Travis Boutin, 31, of Smyrna, and Nicole Blanchfield, 31, of Townsend, DATE said. Agents say they seized more than $1,000 from Boutin. 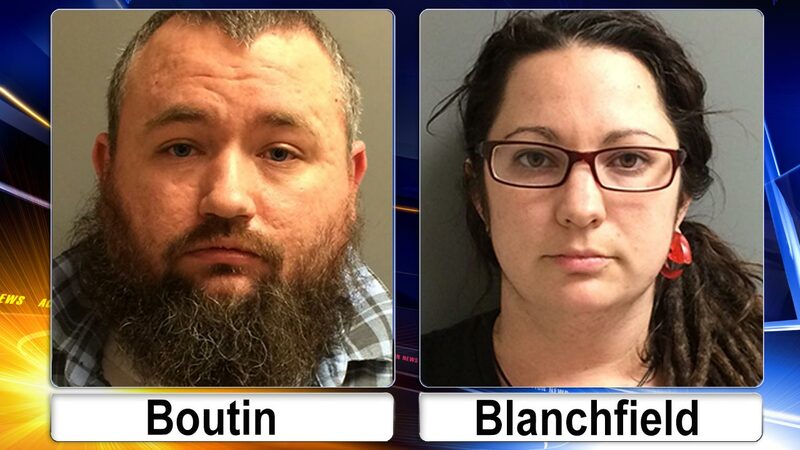 Officers executed a search warrant on Thursday, arrested both Boutin and Blanchfield. PHOTOS: Suspects in marijuana investigation at Del. Another search warrant was executed at Boutin's home in the 500 block of Barley Court in Smyrna. There, they found Andrew Spear, 30, allegedly in possession of marijuana, two loaded handguns and a switchblade. Another suspect, Nathan Muldowney, 31, of Earleville, Maryland, was allegedly found to be involved in marijuana distribution in and around The Celtic Pub. Agents seized nearly $8,000 from him. All were arraigned and released on unsecured bonds. A server was also arrested for allegedly serving drinks in violation of state law, DATE said, and liquor license violations are forthcoming against the establishment.